The Reactor’s metal spring can be adjusted to accommodate a number of different grip styles. Aside from the two usual mouse buttons, a third can be found alongside the aforementioned platform that you can use to flick between web pages, menus and other elements. Once again, it’s placed in a way that feels natural. 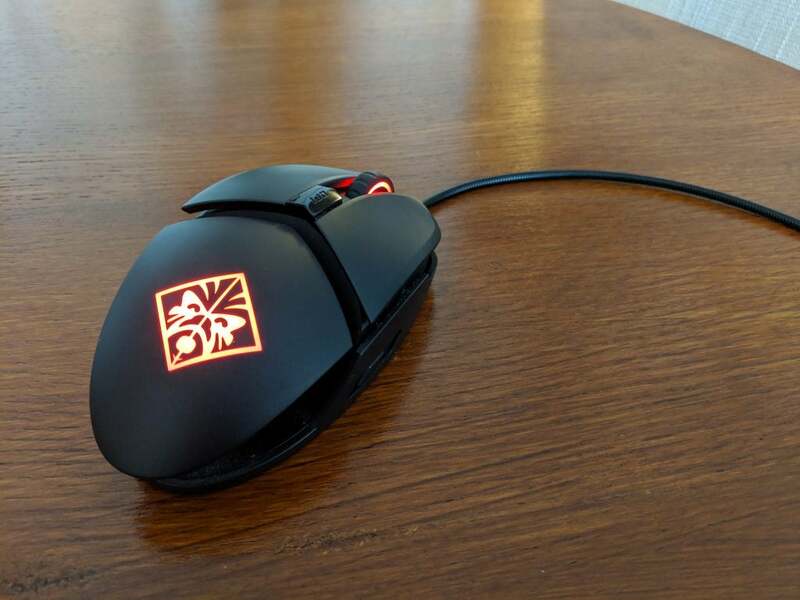 Slide down the mouse itself and you’ll come across the Omen logo, which is enhanced by the implementation of customisable RGB lighting, the specifics of which we’ll get into later. Below this you’ll find a thick metal spring, the height of which can be adjusted to conform to different grip-styles. It’s a nice feature, but not one I found myself using all that much. Whip smart response times make the Reactor adept at fast-paced FPS games. Oh and we have to mention the USB cable that’s attached to the HP Omen Reactor. We know it’s a weird comparison to make, but the braided steel cable is reminiscent of a snake, feeling strange in the hand with an almost stretch-like aesthetic. 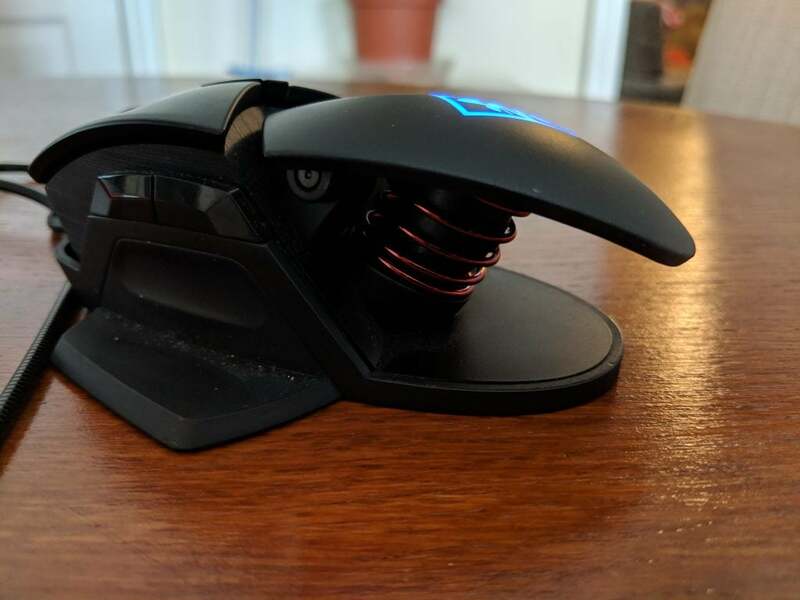 It’s super high quality, and not something we’ve seen on many gaming mice before. Sadly, I’m not entirely sold on the DPI button to adjust the mouse’s sensitivity. I quickly found a sweet spot, but it doesn’t provide an accurate manner in which to adjust DPI to your liking. 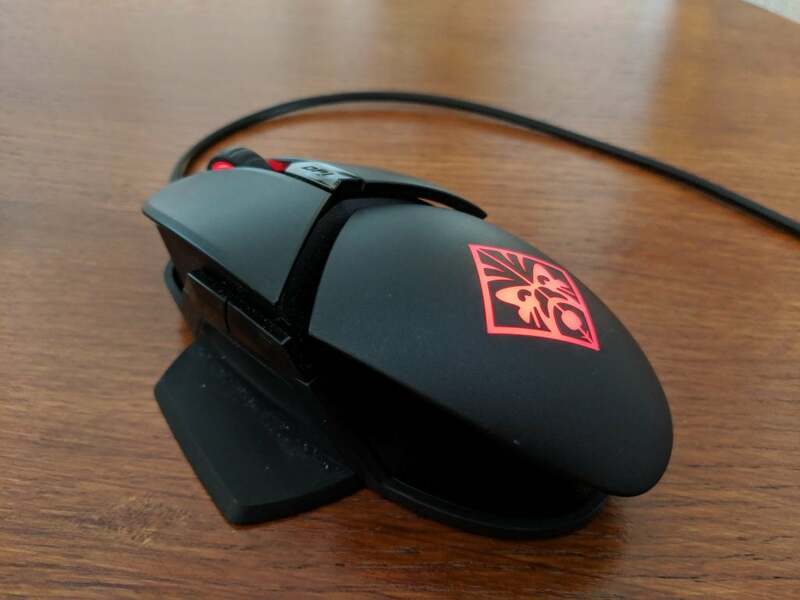 During my testing period with the HP Omen Reactor, I played plenty of Destiny 2 and Overwatch, two first-person shooters that require fast, fluid reactions in order for you to emerge victorious –qualities that would need a robust gaming mouse to support them. Luckily, they’re available here in spades. The 0.2-second response time combined with the optical-mechanical switches make each click feel marvellously responsive, every command you input leaping to the screen in no time at all. It’s great, particularly effective in shooters where several actions are unfolding at any given time. The cable also comes into play here, gliding along my desk and seldom becoming tangled and causing a nuisance. Granted, the Omen Reactor can feel a bit heavy at times, lacking the deft movement you’d want from a high-tier gaming mouse. That being said, it’s hardly a dealbreaker. HP’s Omen Command Centre software lets you sync up your lighting options. You’ll need to download the Omen Command Centre software to make the most of the RGB lighting with this device. This lets you customise the lighting output to colour schemes of your choosing. There’s plenty on offer here, presenting a neat alternative to Razer Synapse if you’re familiar with the company’s range of products. As far as the software is concerned, Command Centre is relatively painless to install and setup from the Microsoft Store. You can adjust lighting to your liking and also assign macro-keys more efficiently. It easily lives up to the standard set by Synapse, although not everyone will be a fan of giving their information to yet another bespoke client. However, due to the Omen Reactor’s design, the lighting is almost always obscured by your hand whilst the device is in use. This makes customisation a bit redundant – unless you’re going to leave your PC on all the time, just to ogle as it cycles through different presets. Why buy the HP Omen Reactor Gaming Mouse? Coming in at £64.99 at most retailers, the HP Omen Reactor presents decent build quality and a plethora of features that make it worthwhile for gamers who are after a decent mouse experience. It’s attractive, responsive and has a wire that feels like a snake. What’s not to love? It’s a shame then that the RGB lighting feels like an afterthought, hardly surfacing during normal use due to it always being obscured by your hand. Even with a few compromises, the HP Omen Reactor remains an excellent gaming mouse at this price. The post HP Omen Reactor Gaming Mouse appeared first on Trusted Reviews.